Pain or stiffness doesn’t mean that you have to give up the activities you love. At Seattle’s Active Wellness – Chiropractic Acupuncture & Massage, we take great care to get you back to the things you love to do. Whether you are experiencing back pain, neck trauma, joint or muscle stiffness, we have the expertise to get you back to the lifestyle you desire. At Active Wellness we don’t just treat the conditions people generally associate with pain. Rather, we provide healing for your entire body. Our goal is to take you from “Passive Wellness” to “Active Wellness”! While treating the central nervous system with Chiropractic care certainly benefits the spine, Massage Therapy soothes the muscular system, and Acupuncture boosts healing energy—resulting in less pain—but can also benefit every part of your body from head to toe. Our skilled staff will help alleviate your pain and educate you on ways to prevent further discomfort. At Active Wellness, our goal is to provide lasting relief to all of our patients. We customize our services to meet your individual needs and take time to get to know all your ailments so that you will enjoy improved mobility and feel better. 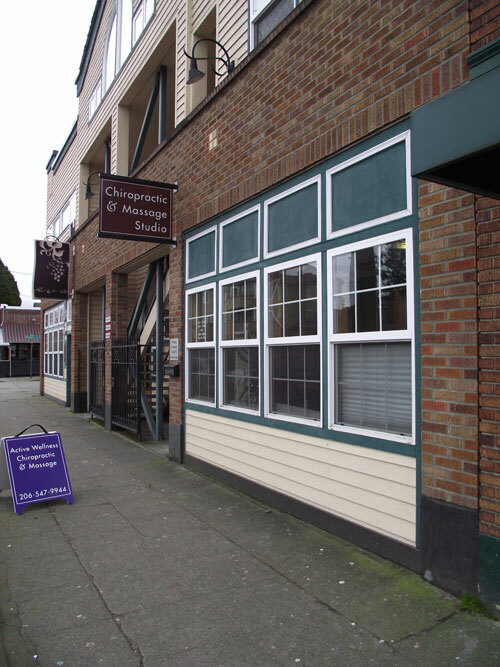 Contact us today to schedule an appointment; you will be glad that you did (206) 547-9944. Just imagine… you at optimal health. ©Seattle Active Wellness Chiropractic and Massage Clinic.